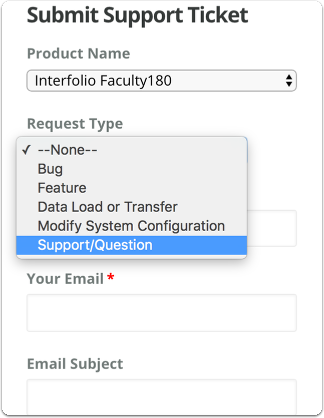 You can find immediate answers and solutions to common questions about Interfolio products through our Help Center. If you can't find a solution, you can submit a support ticket for technical support, customer service, or product assistance. Note: Support tickets work the same as submitting a support request by email. 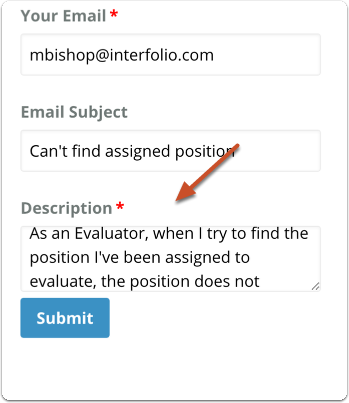 If you prefer, you can still submit help requests by email to help@interfolio.com. In either case, our support agents read every incoming help request to make sure your questions receive a proper response. In order to prevent confusion, and to speed up our support agents' response time, please refrain from opening more than one ticket on the same topic. Access our Help Center at http://product-help.interfolio.com/. Please make sure you fill out all required fields when submitting a support ticket. 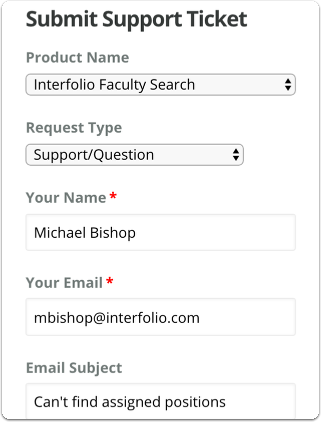 Select the Interfolio product you are using fro the drop down list. Submitting a ticket through this form generates an email to our support personnel. 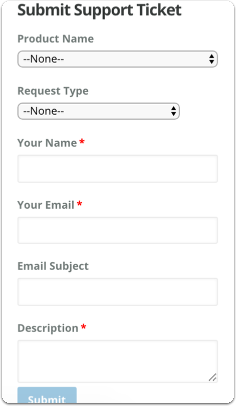 Add a subject so they can quickly reference your request. 4. Describe the issue you are having, and click "Submit"
Remember to be descriptive! Add as much detail as possible about the issue. The more information and context the better. We encourage you to take large screenshots, the more context the better. "As a (User Type [admin, cm, eval, other]), when I try to [X Action] in [X Location], then [X Result] occurs instead of [desired result]." A member of our team will get back to you with an answer as soon as possible. 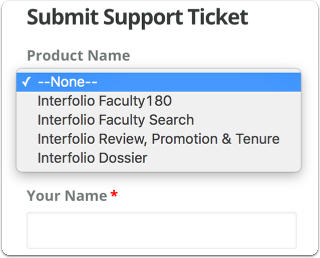 Remember that support tickets can still be created by emailing a help request to help@interfolio.com.